Mr Flynn, 60, came out of the tent first and was knocked to the ground with his throat compressed. Mr Lincoln, 25, then emerged from the tent and tried to photograph the attackers but instead had his camera equipment stolen. The thugs wrestled with both men and the camp and a car was smashed up. Both men were taken to a medical clinic for treatment with "wrestling" injuries. 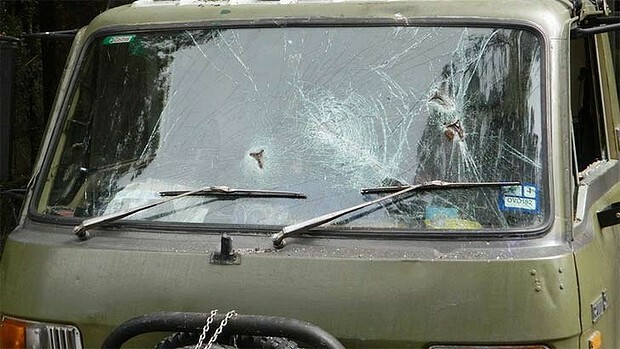 A star-picket was used to smash the windscreen and passenger window of the protester's truck. The protest was set up to stop clear-felling in habitat used by the Victoria's faunal emblem, the Leadbeater's possum. An Australian National University study estimated that the possum's numbers were cut by half by the nearby Black Saturday bushfires. Ms Rees said tensions had been simmering between conservationists and loggers for months. She said a Facebook page, set up by supporters of the timber industry, was "stimulating violence". MyEnvironment sought an injunction against the state-owned timber business, VicForests, to stop it clearfelling in the Toolangi State Forest. It lost its case in the Supreme Court in March but yesterday the group lodged a Court of Appeal challenge to the decision. "We are calling for a full investigation into who (attacked the campers) and what links they might have with the timber industry and individuals higher up in the logging industry," Ms Rees said. A Victoria Police media spokesman Marty Beveridge confirmed Yarra Ranges CIU detectives were investigating the incident at the camp where it is alleged that damage was done to a vehicle and property stolen. State government spokesman Michael Moore said he was unaware of the incident that although ''sounded serious'', was a matter for police. PLANS by Australia’s biggest hardwood sawmill and timber processing operation, Australian Sustainable Hardwoods at Heyfield, to produce electricity from its waste have been stymied by provisions of the Federal government’s carbon pricing scheme. ASH chief executive Vince Hurley explained that despite the operation purchasing only regrowth ash (timber) certified under the Australian Forestry Standard as being a sustainable resource, and being certified to ISO14001 International Environmental Standard, AS4801 Australian Safety Standard and AS4707 Chain of Custody for Certified Wood and Forest products, its waste cannot be used to generate power because of compromises negotiated between the Greens and the government. Mr Hurley summarized the dilemma the company faces as being caught by the agreement between the Greens and the Australian Labor Party enabling the carbon-pricing scheme to pass through the parliament on the provision that anything originating in native forest could not be eligible for carbon credits, and could not qualify as renewable energy. “We (ASH) could build a power station here quite easily, a turbine that could supply our own power, Heyfield, Maffra and more with renewable energy power, just by burning our waste,” Mr Hurley said. Currently ASH uses the sawdust to provide 85 per cent of its energy needs for steaming timber and kiln drying. It buys in 15 per cent of its energy needs in the form of electricity. Mr Hurley argues that a hardwood sawmill utilizing regrowth ash, certified as renewable and having chain of custody for supply, should be treated the same as mills using Radiata pine produced from high-input plantations on land that was formerly productive agricultural land. For more, including details about how the Heyfield mill's new ownership has impacted operations, read Friday's Gippsland Times. NEWLY allocated national parks could be reopened to commercial logging and grazing under controversial Newman Government plans to revive the state's struggling agricultural industries. Protected tracts of native state forest could also be handed back to loggers, ditching conservation agreements that have stood for up to 13 years. National Parks Minister Steve Dickson accused the Bligh government of locking up vast areas that had little preservation value, including former cattle stations. But Mr Dickson promised pristine and long-protected national parks would continue to be safeguarded. 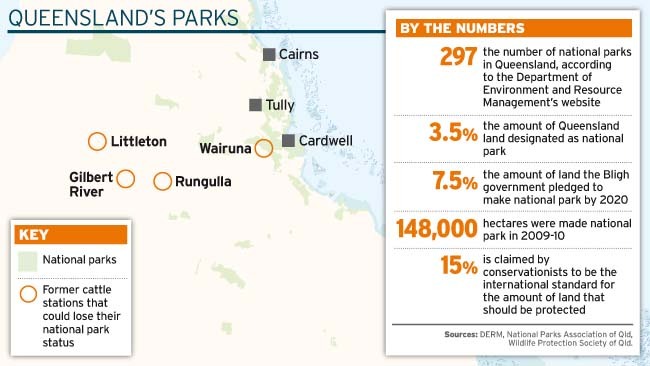 Mr Dickson told The Courier-Mail about 875,000ha of state forest and former cattle stations recently gazetted as national parks were likely to be the first to be rescinded. "What we are doing is an absolute scientific review of all the land we've got," he said. "If it's pristine land that should be in national parks, I'm going to keep it because you don't take away what needs to be preserved for ever more." Mr Dickson said much of the land that would be released had previously been logged, mined or grazed. He named four former cattle stations that could come under the plan, all in north Queensland. Conservationists warned that releasing land would rekindle the 1990s "forest wars" and counter an international shift towards conservation. But Forestry Minister John McVeigh accused the ALP of failing to maintain its vast land reserves and said forests were now riddled with pests and weeds, posing a bushfire threat. He said about 200,000ha of native state forest quarantined as reserves under long-held conservation agreements could also potentially be reopened to logging. The Government would first look to renew state forest access agreements, due to expire within two years, to cypress millers in southern and central Queensland. Tracts of land considered to be of "low-conservation value" within the western hardwoods region and areas protected under the 1999 South East Queensland Forests Agreement would then be targeted. Australian Rainforest Conservation Society president Aila Keto, who played a key role in setting up the SEQ agreement, said studies showed native wood stocks were insufficient to meet logging demand. "The only way that the industry was able to keep going was to keep going to smaller and smaller trees," she said. "Which means that the industry was essentially destroying the ecological integrity of those forests and the wildlife that depends on them." Timber Queensland CEO Rod McInnes said the industry did not want to rush "open slather" back into natural forests but some areas had been wrongly quarantined by the former Beattie government. "We don't clear floor forests, we selectively log about two logs for an area the size of Suncorp Stadium once every couple of years so it's a very light impact," he said. But Mr McInnes warned the change would not be a panacea for a struggling timber industry battling strong international competition, and local mills could be sidestepped if Hancock Plantations Queensland, which bought out the state-owned Forestry Plantations under the Bligh government's 2010 asset sales, sent timber to China for processing. A major plan released last Friday shows that mapping the timber industry's future and restoring beekeeper access to native forests are among the Government's key actions for the six months ahead. AgForce last night welcomed moves to reopen former grazing land to cattle but Wilderness Society campaign manager Tim Seelig said that declassifying designated national parks was "an outrageous act". State Labor is planning to recapture the success of its 2001 ban on old-growth logging with a new forest policy that could include a halt to all native logging or ban the felling of jarrah. Shadow environment minister Sally Talbot yesterday confirmed Labor was working through a range of options for WA's new 10-year forest management plan, which comes into effect in January 2014. She said the final policy was yet to be determined but Labor was taking "very seriously" two Environmental Protection Authority reports since 2010 that noted the northern jarrah forest was unlikely to sustain current logging levels. 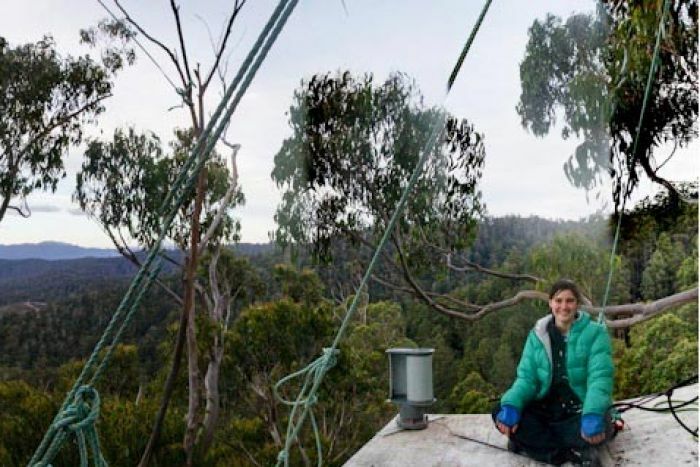 "There are a whole series of policies being worked on and certainly we are interested in native forests, I mean Labor's got the runs on the board as far as ending the logging of old growth goes," Dr Talbot said. "We are confident that we will come up with something that lives up to Labor's record, that we're pretty proud of." Labor's ban on old-growth logging is one of the factors credited with delivering Geoff Gallop the premiership 11 years ago. David Gosatti, group manager of fabricated timber manufacturer Inglewood Products, said a ban on native logging would sound the death knell for his 50-year-old family business. "There's no alternative timbers for us to mill," he said. "We've done a lot of work with the Forest Products Commission on plantation timber. "But for using them in products that we produce - which is joinery, flooring and other building products - none are suitable in that you can import cheaper timbers that are of better quality than we have access to here." A forest commission spokes-woman said an about 3000 people were directly or indirectly employed by the native logging industry and a ban would result in mill closures and impact on regional communities. Old-growth forests are native forests that have never been logged. Native forest logging happens in the South West near Manjimup, Nannup, Northcliffe and Warup, west of Wagin. Greens MP Giz Watson said there was not much tall jarrah left in WA. "We are always delighted when other political parties reach the same position we do," she said. "We want to have an end to native logging and we can't do that on our own." WHEN is an environment group no longer an environment group? Seems an odd question to ask in a rural paper, but stick with me. Planet Ark, famous for encouraging us to recycle greetings cards to save trees, is set to endorse clearfell logging of native forest. The Australian Forestry Standard - an alternative logging certification system pushed by logging operations who do not have more community-based Forestry Stewardship Certification - needs an "environment" group to give it a tick. And Planet Ark, which recently did a deal with the Forest and Wood Products Association to help Planet Ark out of financial dire straits, is set to provide it. Just last week AFS certified Forestry Tasmania's controversial operations. Environment groups working on a transition to plantation logging are fuming. Planet Ark's position is also at odds with Liberal leader Tony Abbott, who said recently most people were "revolted" by clearfell native forest logging - a statement aimed at winning votes from Labor MP Rob Mitchell in McEwen, where the issue is hot. One wonders whether a group could gain a seat on, say, a government committee or panel, by saying it represents a certain cause when there is evidence to the contrary. What if PETA began funding an existing farm group, or set up its own, perhaps called the Australian Farm Lobby, and appeared on stakeholder committees as if it were an advocate for farmers? What if it got a say in formulating industry standards, with a charity status? The extraordinarily well-funded PETA has done much trickier things. One wonders what Environment Minister Tony Burke thinks about Planet Ark's environmental charity group status, given it takes money from a vested interest which has been at war with the movement it claims to represent for decades. And what Agriculture Minister Joe Ludwig would do if a similar issue arose in farming.